“Consider the work of God: for who can make that straight which He has made crooked?” —Ecclesiastes 7:13. …and this view can only be obtained only by faith, not by sense; for it is the “Light of the World” alone that represents them justly, discovering in them the work of God, and consequently, crooked designs becoming the Divine perfections. When they are perceived by the eye of faith, and duly considered, we have a just view of our afflictions, fitted to quell the turbulent motions of corrupt affections under dismal outward appearances. It is under this view that Solomon, in the preceding part of Ecclesiastes 7, advances several paradoxes, which are surprising determinations in favor of certain things, that, to the eye of sense, looking gloomy and hideous, are therefore generally reputed out of order, and shocking. For he pronounces the day of one’s death to be better than the day of his birth; namely, the day of the death of one, who, having become the friend of God through faith, has led a life to the honor of God, and service of his generation, and in this way raised to himself the good and savvy name better than precious ointment. 2. The suitableness of it. 1. The remedy itself, is a wise eyeing of the hand of God on all we find hard to bear on us: “Consider the work of God,” namely, His providence in the crooked, rough, and disagreeable parts of your afflictions, the crosses you find in it. For you see very well the cross itself. Yes, you turn it over and over in your mind and leisurely view it on all sides. You look to the primary cause of it, and also to the other secondary cause of it, and so you find yourself in a fret. But, would that you would be quieted and satisfied in the matter, lifting up your eyes towards heaven, seeing the doing of God in it, the operation of His hand. Look at that, and consider it well; eye the first look at the crookedness in your lot; but behold, how it is the work of God, how is it His doing? 2. Such a view of the crookedness of our afflictions is very suitable to still improper risings of heart, and quiet us under them: “For who can make that straight which God has made crooked?” As to the crookedness in your life, God has made it; and he will continue while He will have it so. Should you ply your utmost force to even things out, or make it straight, your attempt will be vain: for it will not change no matter what you do. Only He who made it can mend it, or make it straight. This consideration, this view of the matter, is the proper means at once to silence and to satisfy man, and so to bring him to a dutiful submission to his Maker and Governor, no matter the crookedness and afflictions in his life. First, to that end, be watchful over your thoughts. Do not take liberty to let your hearts run too far in the things of the earth. What time you have for meditation, let it be as much as can be reserved for spiritual things. Most men and women think they may take liberty in their thoughts. Why, the thing in itself is not unlawful! Aye, but your thoughts will steal upon you and affect your heart very much; therefore, watch narrowly over your thoughts, keep them within Scripture bounds. Be humbled much for sin, for that will take off the heart from earthly-mindedness. Earthly-minded men, who have earthly and drossy hearts, have not known what the weight and burden of sin means. Just let God lay the weight and burden of sin upon the soul, for that will take off the soul from earthly things quickly! Oh, those men that have gone on in the world in a secure condition, and never knew what trouble of conscience meant for sin, have grown seared in those earthly contentment’s. But those men that have had the weight of sin lie upon them know what it is to have to deal with an infinite God. In bearing the burden of the wrath of an incensed Deity, such men know that they have other things to look after than the things of the earth. 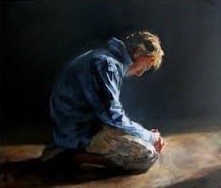 If God would just humble your hearts, the humiliation of your spirits would quicken you, take off the dullness and deadness of your spirits, and stir you up to look after things other than the things of this life. Further, set the example of the saints before you who have been the most precious servants of God in former times. Note how they counted themselves as pilgrims and strangers here on the earth. At your leisure, read Hebrews 11:13, These all died in faith, not having received the promises, but having seen them afar off, and were persuaded of them and embraced them, and confessed that they were strangers and pilgrims on the earth. Mark, therefore, how it follows in the 37th verse, “They were stoned, they were sawn asunder, were tempted, were slain with the sword, they wandered about in sheepskins and goatskins, being destitute, afflicted, tormented.” Who were these people? They were those of whom the world was not worthy. They wandered in deserts, and in mountains, and in dens and caves of the earth, and yet were such precious saints of God that the world was not worthy of them. Now when we set before us how joyfully these servants of the Most High went through all their wilderness condition, this should make us ashamed of our earthly-mindedness, and would be a mighty help to us. Then, if we consider the great account that we are to give for all earthly things, you will note that you only look upon the comfort of them. But consider the account you must give for them. This would be a means to take off the heart from earthly-mindedness. And consider, what if you were now to die and go the way of all flesh. What good would it be to me to remember what contentments and pleasures I had in the earth? But above all, set Jesus Christ before you and be meditating on the death of Jesus Christ. That’s the great thing that will take the heart from the things of the earth. Be looking upon Christ crucified, how He who was the Lord of heaven and earth put Himself into such a low condition merely to redeem us! Conversing much with the death of Jesus Christ deadens the heart much to the world. In Philippians 3 we have a notable text for that, in the example of Paul. He counted all things as dung and dross for Jesus Christ. In the 8th verse, I account all things but loss for the excellency of the knowledge of Christ Jesus my Lord, for Whom I have suffered the loss of all things, and do count them but DUNG that I may win Christ. Then, in the 10th verse, That I may know Him, and the power of His resurrection, and the fellowship of His sufferings, being made conformable to His death. Paul desired to be so conformable to the very death of Christ, that he counted all things in the world but as dung and dross in comparison of that. Paul had the death of Christ before his eyes, and meditated much on the death of Christ, and that meditation had a great impression upon his spirit. That made him count all these things as dross, as dog’s meat by comparison, that he might have fellowship with the death of Christ. O my brethren! To close all this, I beseech you, let not this be said concerning any of you, that you have such and such worldly enjoyments that you cannot inquire about Jesus Christ. Do not plead that you have such great business, that you had so much to do in this earth, that you take little notice of the things of heaven. Surely, the saints of God have their business in heaven as we shall, God willing, see hereafter. Their city business, their trading, their aims, their bent is higher than the things of this earth. There are things that a man may let out his thoughts and affections to as much as he wants. This shows the vanity of the things of this world, that a man needs to be very wary how much he minds them. He cannot enjoy the comforts of this earth without some fear. But now, when he comes to converse with heaven, there he may let out himself to the uttermost. That shows the excellency of these things. You that are poor and lowly in the things of this earth, do not be discomforted because there is a charge from God that men should not mind these things. Surely there is no great matter in them since God charges that we should not mind them. O the excellency lies in things above which are heavenly and spiritual, where the saints have their conversation!